Last year, we had an astonishing fruit harvest, and I took advantage of the opportunity to try out different ways of preserving the bounty. 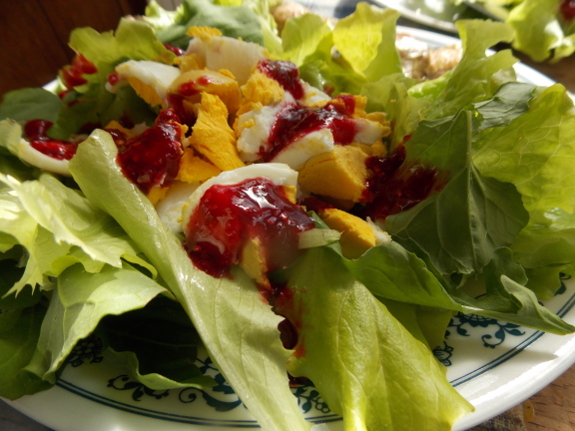 We've enjoyed large quantities of strawberries for years now, so we know that strawberry freezer jam is astonishingly good when heated enough to pour sparingly over spring salads and that strawberry leather is a delicious dessert. But how about ways of preserving extra peaches, raspberries, and blackberries? Last summer, I tried a bunch of different preservation methods, and after a winter of eating out of the larder, I now know which techniques are worth repeating and which aren't. White peaches are best fresh, and I was disappointed by the leather I made out of those that weren't quite ripe (but had to be cut into before brown rot overtook the whole fruit). On the other hand, cooking down those not-quite-ripe peaches until they were quite thick and then freezing the sauce turned out to be a delicious addition to my morning bowls of kefir. With the extra berries, I tried out various kinds of jam. I have to admit that even though I had fun experimenting with traditional types of jam-making, the results were too sweet and too cooked for my palate. On the other hand raspberry freezer jam and blackberry freezer jam were quite possibly even better than strawberry freezer jam...although next year I might strain the seeds out of the bramble fruits since they're a bit harder between your teeth than strawberry seeds are. On a mostly unrelated note, we're also tasting the first asparagus of the year this week. We haven't had to get creative there because asparagus roasted with a bit of oil, salt, and pepper is so good, we eat it like candy. 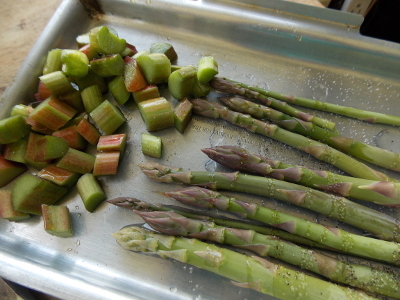 Like strawberries, we feel like there can never be too much asparagus in our kitchen and on our table.